The Legislature first designated Alabama state tree as the Southern pine tree in 1949. Because there are so many kinds of pine trees, the Southern Longleaf Pine, (Pinus palustris Miller,) was specified as the state tree of Alabama by the Legislature in 1997 when, on May 22, 1997, Governor Forrest Hood (Fob) James, Jr. signed State Representative Gerald Willis' House Bill No. 533 specifically naming the southern longleaf pine (Pinus palustris) as the official state tree of Alabama. The longleaf pine, adopted by Alabama as the "Southern longleaf pine" is also known as longstraw, yellow, southern yellow, swamp, hard or heart, pitch, and Georgia pine. Pinus palustris, commonly known as the Longleaf Pine, is a pine native to the southeastern United States, found along the coastal plain from eastern Texas to southeast Virginia, extending into northern and central Florida. 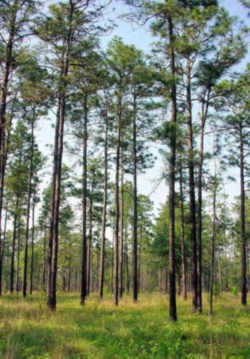 Longleaf pine is distributed primarily in the lower two thirds of the state. It may be distinguished by the needles which occur in bundles of threes and are about 12 inches long. The cones are about seven inches long. Longleaf pine is peculiar among all trees in that it develops very little above ground during the first one to five years of its life. 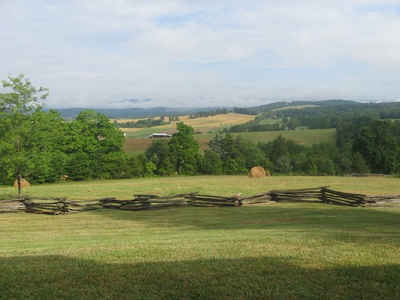 During this time the top is a dense bunch of green needles and is often mistaken for grass. This tree is found on a variety of sites but grows best on well-drained sandy soils. Longleaf pine can grow to a height of about 150 feet and a diameter of nearly four feet. The very long needles and cones and the needles in bundles of 3 are characteristic of this species. The buds of non-growing season individuals are a distinctive white. Long-leaf Pine might be confused with three other species in its native range; 1. Loblolly Pine (Pinus taeda), 2. Slash Pine (Pinus elliottii), and 3. Pond Pine (Pinus serotina). 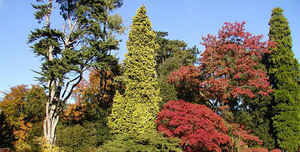 Usually the needles and cones are longer than in any of these three species. 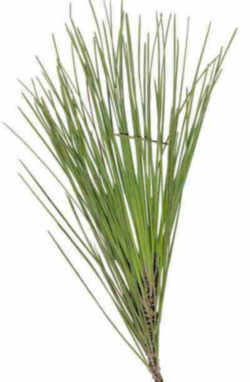 The needles of Slash Pine are usually in bundles of 2, although bundles of 3 also exist. The cones of Loblolly Pine are only 2 to 6 inches long (not the 6 to 10 inches of Long-leaf Pine and the cone is rounder and less elongate. 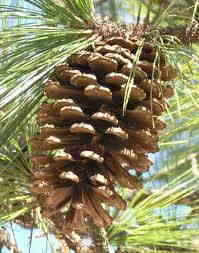 The cones of Pond Pine are only 2 to 2.5 inches in length and again the needles are generally shorter (6 to 8 inches long) relative to the 8 to 18 inch length of Lonf-leaf Pine. Leaf: Evergreen, very long and feathery (8 to 18 inches long), with three dark green needles per fascicle. Flower: Monoecious; males yellow-red, long, in clusters; females oval, purple. Fruit: Very large (largest cone in the Eastern U. S. --6 to 10 inches long), ovoid to conical in shape, sessile. Scales are red-brown in color. The umbo is armed with a curved prickle. Maturing September to October. Twig: Very stout, brown, with large obvious, asbestos-white buds. Bark: Quite scaly, orange-brown to gray, will eventually develop plates. 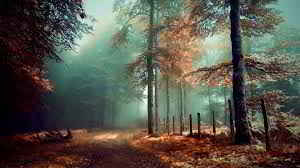 Form: A medium-sized tree with a straight trunk, coarse branches and tufted needles at ends of branches. The law designating the southern longleaf pine as the official Alabama state tree is found in the Unannotated Code of Alabama 1975, Title 1, Chapter 2, Section 1-2-12. The southern longleaf pine, Pinus palustris Miller, is hereby designated and named as the official state tree of Alabama. A specimen of the state tree shall be deposited in the Auburn University Herbarium, which is the State Herbarium for Alabama.